This article appeared in a National Review Online symposium celebrating Bernard Lewis. 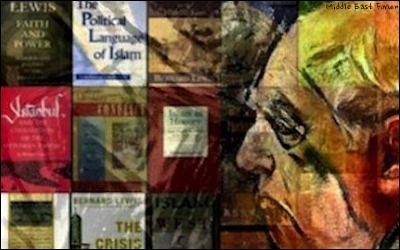 Bernard Lewis has irrevocably shaped the landscape of modern Middle East Studies. 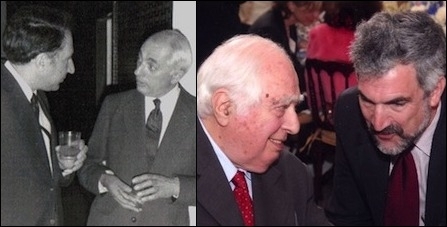 The historian Bernard Lewis celebrates his 100th birthday today. The University of California's R. Stephen Humphreys notes "the extraordinary range of his scholarship [and] his capacity to command the totality of Islamic and Middle Eastern history from Muhammad down to the present day." And, as the late Fouad Ajami of Johns Hopkins University put it on Lewis' 90th birthday, he is "the oracle of this new age of the Americans in the lands of the Arab and Islamic worlds." Lewis' career spanned a monumental 75 years, from his first article ("The Islamic Guilds") in 1937 to his autobiography in 2012. Midway, in 1969, he entered my life. In Israel the summer between my sophomore and junior years in college, with my aspirations to become a mathematician in doubt, I thought of switching to Middle East studies. To sample this new field, I visited Ludwig Mayer's renowned bookstore in Jerusalem and purchased The Arabs in History, Lewis' 1950 book. Left: Bernard Lewis (right) with the author's father, Richard Pipes, in London, May 1974. Right: Lewis (left) with the author in New York City, May 2008. It launched my career. Over the next 47 years, Lewis continued to exert a profound influence on my studies. Although never his formal student, I absorbed his views, reading nearly all his writings and favorably reviewing seven of his books (in 1982, 1986, 1988, 1989, 1994, 1996, and 2000), far more than those of any other author. His name appears on 508 pages of my website. Beyond numbers, he more than anyone else influenced my understanding of the Middle East and Islam. That said, he and I argued strenuously during the George W. Bush years, narrowly on Iraq policy (I was more skeptical of U.S. efforts) and broadly on the matter of bringing freedom to the Middle East (ditto). Bernard Lewis more than ever is an inspiration to his many self-identified disciples. I first met Professor Lewis in 1973 in London, when he generously invited me to his house and offered advice on my Ph.D. studies. I saw him most recently, twice, at his small apartment in the Philadelphia suburbs. He's impressively fit in body and mind, spending time on the computer, ever the raconteur ("What's a Jewish joke? One which non-Jews can't understand and Jews have heard a better version of"), and conjuring up anecdotes from a time before the rest of us were born (his 1946 discussion with Abba Eban about the latter's career choices). It's wonderful to see him doing well even if it's sadly understandable that he no longer engages in scholarship nor opines on current events. Born a mere 15 days after the Sykes-Picot agreement that defined the modern Middle East, their common May centennial finds Syria and Iraq in shreds but Bernard Lewis more than ever is an inspiration to his many self-identified disciples, including this one.